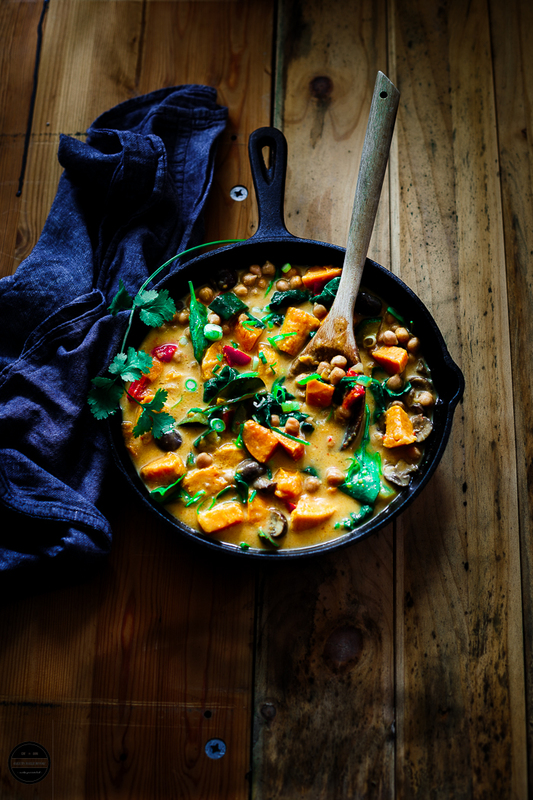 This hearty, creamy and comforting Thai Sweet Potato, Chickpea and Mushroom Curry recipe is bursting with so many flavours and this curry is so easy and simple. This curry is loaded with autumn and winter produce such as sweet potato and mushrooms adding their heavenly aroma and rich flavour. This curry is cooked with nourishing and colourful autumn vegetables in homemade coconut red curry sauce which can be prepared mild or spicy. 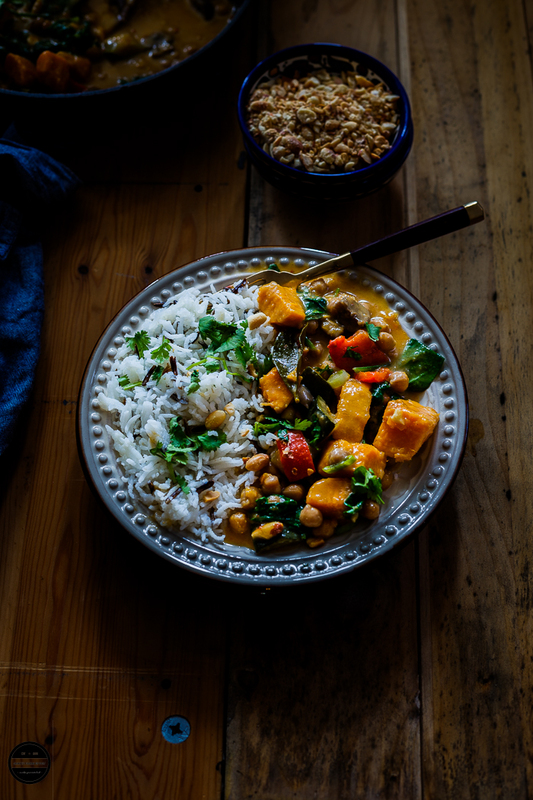 And above all, a bonus point is that this curry is completely vegan, so I urge you to try this recipe this autumn and winter season as this curry is a beautiful way to enjoy and celebrate all the best produces of this colourful season as Autumn is well and truly here in my part of the world. It is definitely time for fuzzy slippers, comfort curries to gorge on. This curry can be made in a tick and can be a great midweek dinner. 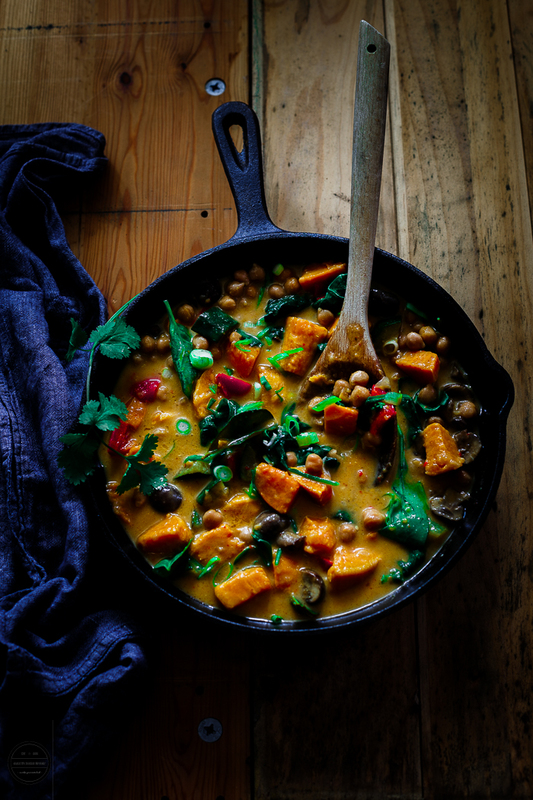 In addition to sweet potato in this curry is bulked up with really healthy ingredients such as chickpeas, mushrooms and spinach. However, you can use whatever you have to hand like instead of sweet potatoes butternut squash and either spinach can be replaced with kale. I have served this curry with cooked Basmati and Wild rice, but if you can't find wild rice you can serve with only Basmati rice too. 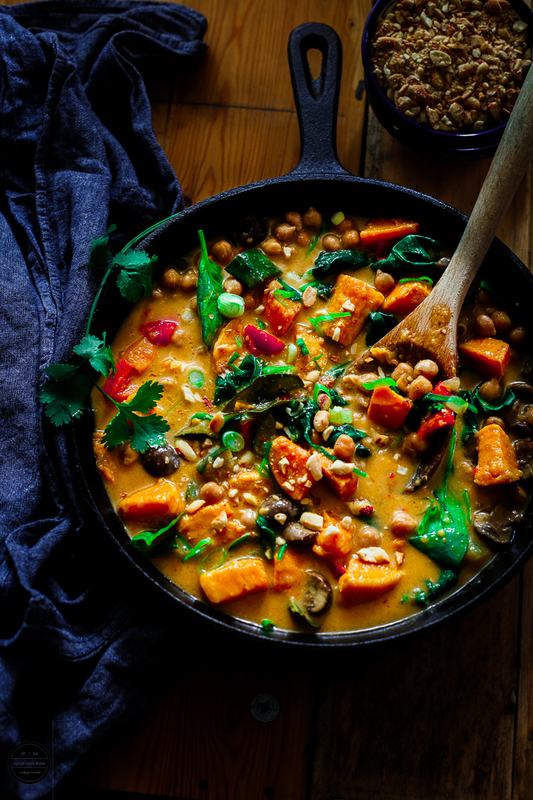 This vegan and healthy Thai Sweet Potato, Chickpea and Mushroom Curry is so wonderful, it is a perfect comfort food for the colder days. Heat oil in a heavy bottom pan and fry the chopped shallots or onion until light pink.Add chopped sweet potatoes and stir well.Cover the pan with the lid and let the sweet potato chunks cook for 5-7 minutes on a very low heat.Now add chopped mushrooms and stir well.Add curry paste and soy sauce, combine everything. After 3-4 minutes add coconut milk with 50ml water and let the curry cook for a while.Now add red bell pepper and chickpeas and let the curry cook further for 5-7 minutes.Let the curry simmer till sauce gets thicker.Now stir in spinach until wilted and add salt and palm sugar.Add half of the peanuts and coriander, add lime juice and mix well.Serve hot with cooked basmati and wild rice.Enjoy! This looks like my dream curry! 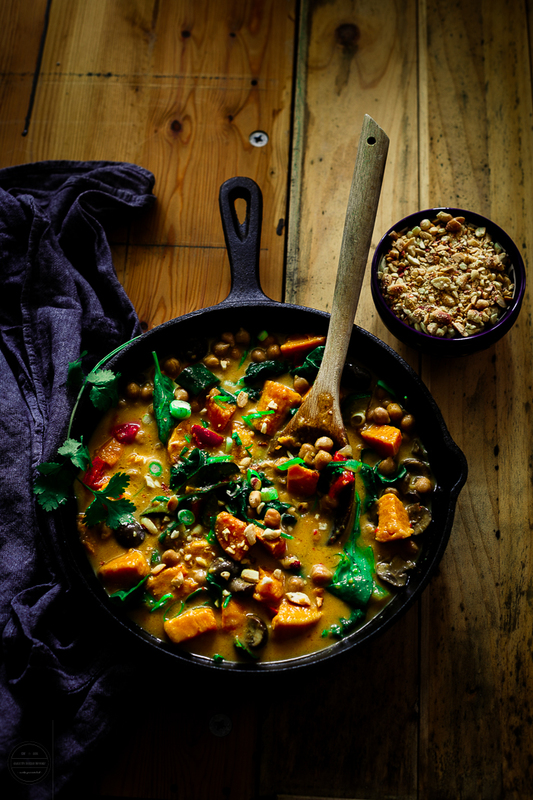 Absolutely love all the flavours in your thai curry here and the combination of sweet potato, chickpea and mushroom brings together some of my very favourite vegetables! That is such a beautiful, colorful dish with all of my favorite flavors! I'm definitely giving this wonderful recipe a try! This sounds like my kind of curry! I love anything with chickpeas in, so a nice cheap way to add some veggie protein. What a beautiful and nourishing dish. I love that you served it with a mixture of wild and basmati rice. This curry look so delicious and the photos are amazing!!! A perfect cold weather meal. All the colors make it really pretty, too! This curry looks amazing and colourful! It looks so flavourful too. I love all the fall and winter produce you put in this curry. This curry looks like it would make an awesome weeknight dinner. I love curries and this one just looks awesome! (Also, your photos are stunning). I like the addition of sweet potato in curry. Looks delicious. Healthy combo of vegetables.. the curry looks yummy. OMG this is so tempting. I just love Thai cuisine.... Curry looks vibrant and inviting. Wow this is delicious. Will definitely try making it.